Fire-resistant varnish for wood and wood-based surfaces: plywood, particle boards and OSB boards. UNIEPAL DREW SPECIAL FR varnish is intended for fire-proofing and decorative finishing of wooden surfaces made of domestic wood species and wood-based materials: plywood, particle boards and OSB boards used inside living and public spaces as well as outside buildings. Products coated with UNIEPAL-DREW varnish in the amount of at least 200 g / m², have been classified in the scope of the degree of flammability: elements made of wood and OSB boards with a thickness of at least 12 mm - as hardly flammable (C-s2.d0). Wall cladding of wood with a thickness of at least 20 mm and density of at least 450 kg / m³ and OSB boards with a thickness of at least 22 mm, painted with UNIEPAL-DREW lacquer in an amount of at least 200 g / m², have been classified as fire retardant. The product does not apply to exotic wood species. Preparation of the varnish: Mix the product thoroughly before use. Dilution of the preparation is not recommended. If the threading phenomenon occurs, the viscosity of the varnish can be reduced by adding xylene or white spirits in an amount not exceeding 10%. Substrate preparation: Fill any surface defects, clean, degrease and dust the substrate. 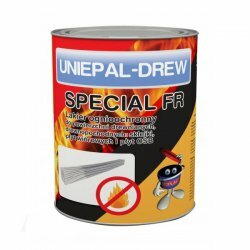 UNIEPAL DREW SPECIAL FR should be applied only to surfaces made of raw wood with a relative humidity not exceeding 20%. After drying, the varnish creates a colorless coating without changing the color of the wood. Application: Apply the varnish at a temperature above 10 ºC. Before starting the actual work, it is recommended to carry out a small scale test in order to optimize the application parameters (performance, pourability, drying time, etc.). Apply two or three times on the vertical and horizontal planes in a total quantity of at least 200 g / m². The thickness of a single wet layer should not exceed 60 μm. The final coating thickness should be min. 120 μm The interval between successive treatments depends on the temperature and humidity of the environment. At 23ºC (± 2) and 50% relative humidity (± 5) the second coat can be applied after 16 hours, the third after the previous layers have dried completely. In case when high aesthetics of wood finish is important, it is recommended to apply the first application with a thin layer, and after drying sand with abrasive material> 240 to remove hairs. Immediately after finishing work, spray tools or a brush with xylene or white spirit should be thoroughly cleaned. Efficiency: max. 5 m² / l for complete painting depending on the absorbency of the substrate. Solubility: insoluble in water, soluble in some organic solvents. After drying, it forms a colorless coating without changing the color of the wood. Surfaces covered with other varnishes can change the fire classification. Varnish is not suitable for painting floors.